This book addresses the field of geographic information extraction and retrieval from textual documents. Geographic information retrieval is a rapidly emerging subject, a trend fostered by the growing power of the Internet and the emerging possibilities of data dissemination. After positioning his work in this field in Chapter 1, the author makes proposals in the following two chapters. 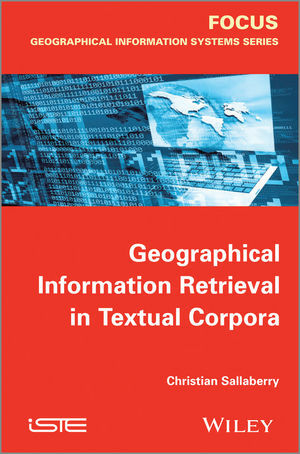 Chapter 2 focuses on spatial and temporal information indexing and retrieval in corpora of textual documents. Propositions for both spatial and temporal information retrieval (IR) are made. Chapter 3 tackles the use of generalized spatial and temporal indexes, which are produced from there in the framework of multi-criteria IR. Geographic IR (GIR) is discussed at length, since this IR combines the criteria of spatial, temporal and thematic research. The author provides a rich bibliographical study of the current approaches focused on the modeling and retrieval of spatial and temporal information in textual documents, and similarity measures developed thus far in the literature. The book concludes with a broad perspective of the remaining scientific challenges. Several areas of research are discussed, such as integration of a domain-based ontology, modeling of spatial footprints from the interpretation of spatial relation, and parsing of relations between features deemed relevant within a document resulting from a GIR process. 1. Access by Geographic Content to Textual Corpora: What Orientations ? 2. Spatial and Temporal Information Retrieval in Textual Corpora. 3. Multicriteria Information Retrieval in Textual Corpora. Christian Sallaberry is currently Assistant Professor at the Law, Economics and Management Faculty in Pau, France. His current research interests are in the fields of geographical information retrieval (GIR) in textual corpora: spatial, temporal and thematic information recognition, analyzing, indexing and retrieval. He is interested in spatial, temporal and thematic criteria combinations within a GIR process.